After our amazing time in Ubud we stayed in Sanur for the remainder of our time in Bali. Sanur is on the east side of the island and there are zero waves. Sanur is the perfect place to paddle board, jet ski, or just chill in the water and appreciate how clear it is. But we really wanted to learn to surf in Bali. 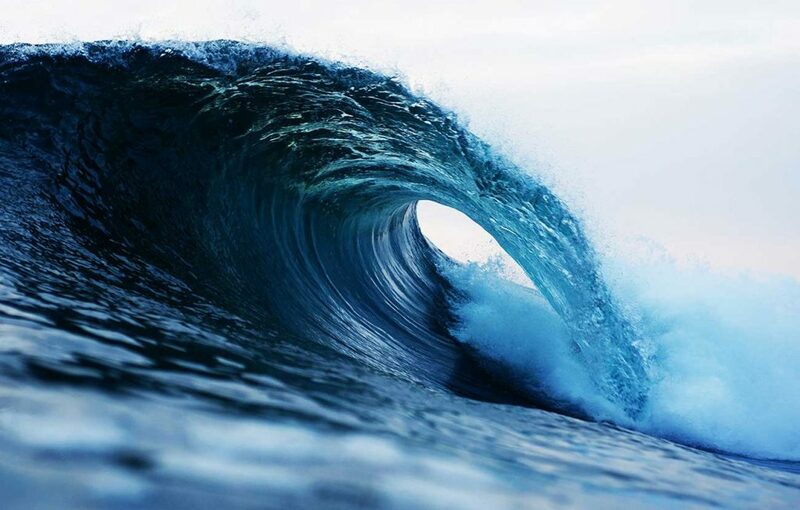 Kuta is the perfect place for surfing! It’s on the west side of Bali and is known for the party scene. From our short time in Kuta, whether it was staying at a coworking space when our internet in Sanur was down or visiting to hit the surf and eat at some warungs, we can confirm that the vibe in Kuta is much livelier than Sanur. We found 7surf through Airbnb. 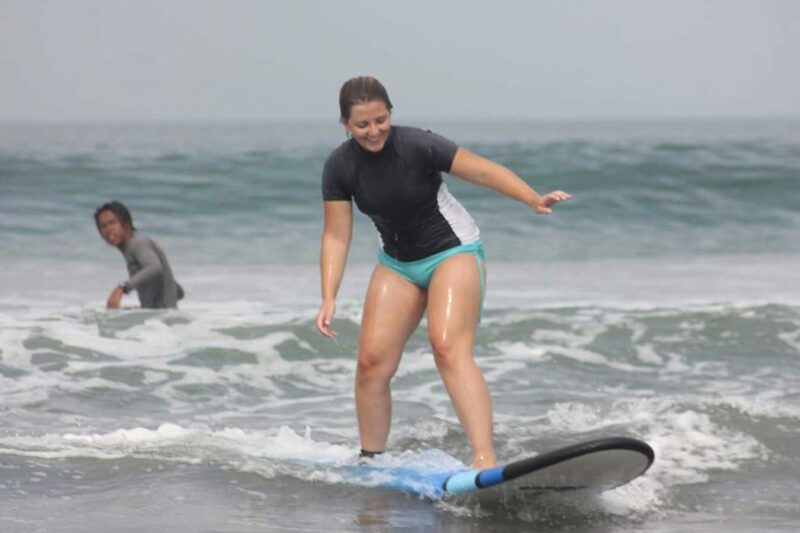 It was only $11 per person for 2 hour surf lessons and they took awesome pictures. Neither of has had surfed before and they welcome beginners. If you don’t book through Airbnb or elsewhere online, you can just walk up to one of the thousands of surf stands along Kuta. Okay, not thousands, but there are A LOT. Most likely, you will find that they are all reasonably priced. Yoko, the owner of 7surf, was a really cool dude who even sat down with us for a nice conversation after our lesson. We highly recommend! Ever since Darah saw Lilo and Stitch as a little girl she’s wanted to learn how to surf. 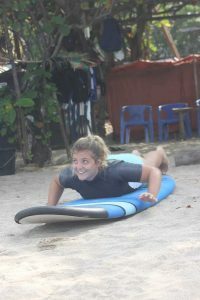 We finally got the chance to make her dreams come true when we discovered you can learn to Surf in Bali for dirt cheap! After an early start, we grabbed a Grab from Sanur to Kuta; Darah softly sang Hawaiian Roller Coaster Ride the entire time. What’s a Surf Lesson Like? We are by no means experts at surfing but here’s how our experience went and hopefully it’ll prepare you for yours. 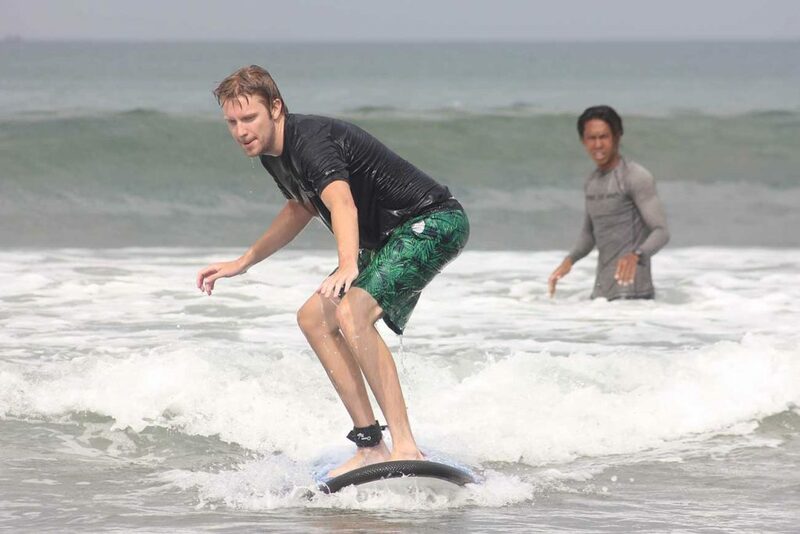 Most surf lessons in Bali last from 2 to 2 ½ hours and take place in the morning or afternoon. Our lesson started at 8am and was two hours long with a short break in the middle. Water was provided! A longer lesson would have been too exhausting for us. We recommend the morning because it’s cooler and then you can walk to a warung and relax with some fruit smoothies and coffee for lunch! The lessons begin on shore, the instructor teaching you how to stand up and paddle. Then you move to the water where your instructor will tell you to get on your board. Instead of paddling on your own to gain momentum, he’ll push you. Eventually, if you show enough progress, you can start paddling on your own. 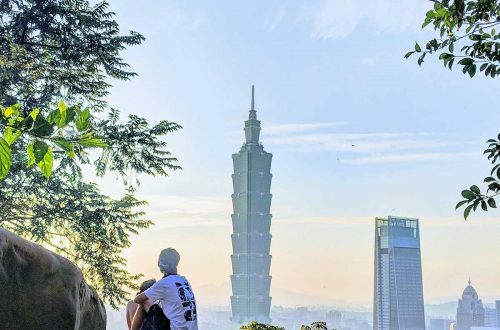 The most important thing is to relax and have fun. We bailed countless times before being able to ride a wave. Halfway through our first session Garrett was able to start paddling on his own and spent the entire second session paddling and riding waves. Unfortunately, Darah is not as coordinated and ended up being pushed the entire time. We assumed correctly that learning how to surf was going to take a toll on our bodies. To say the least, we were “wiped out” the rest of the day. Tehe. And extremely sore the next. 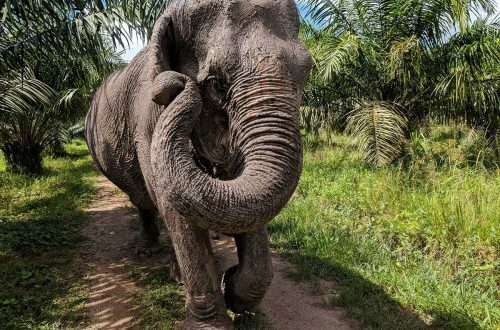 However, we had no idea that we would get severe calluses on our hands or that our legs would be stinging long after we left the water. Even though we took a beating, surf lessons in Kuta were one of our favorite memories in Bali. If you’re looking to learn how to surf then we recommend getting over to Kuta but Canggu, Seminyak, and Legian are also great places for beginners. Whether you’re a beginner like us or you know your way around the waves, you need to learn to surf in Bali! You won’t regret it! 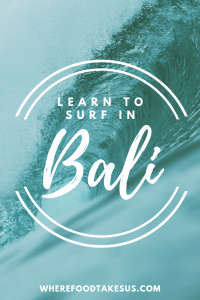 Do you want to learn to surf in Bali? Have you taken a lesson before? Tell us your story below!